It dawned on me the other day that none of the children's activity groups I run gives me scope to run an autumn themed craft session this year. This is a very sad state of affairs, I love autumn! 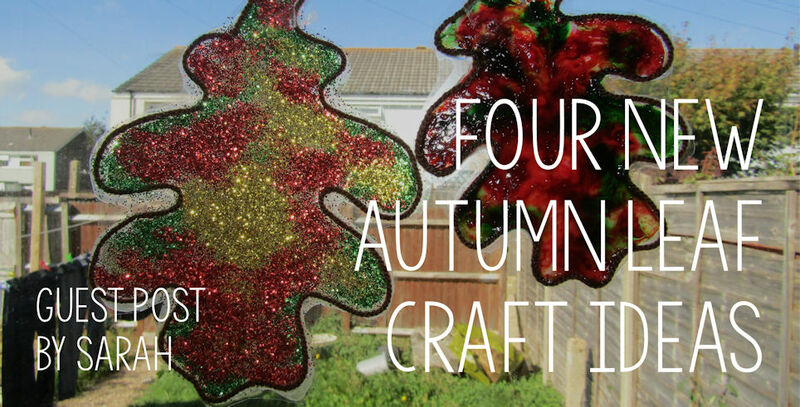 So I opted to spend Sunday afternoon sitting in the autumn sunshine in my craft room making some of the crafts I would have done with a group if I had unlimited free time, so I could share them with you on Activity Village. Sadly at age 16 and 13 the boys could not be persuaded away from their screens to join me (they did their bit for Activity Village later on in the day helping test a few games I have in the pipeline) but I find simple crafts very relaxing and had a pleasant time of it anyway. The four crafts featured here all use our autumn leaf templates. Autumn leaves make lovely class or group projects as they can be brought together and used to make a a group garland or an autumn tree display. At home with one or two children there is the opportunity to try different techniques to make different leaves and make your own display. I'm loving using art tissue paper at the moment - the sort where the colours bleed. I love the different effects that can be produced so simply. This craft is incredibly simple but the results were stunning. I printed one of our large leaf templates. Then ripped into small pieces some yellow, orange, red, brown and green art tissue paper. I painted part of the leaf template with water and stuck on the tissue paper, adding lots more water over the top to make sure the tissue paper was stuck down. When the leaf was completely covered I left it to dry. When the tissue paper dries it easily peels off leaving a lovely mix of colours. To finish off I cut out the leaf. Full instructions and more photos here. I used a second large leaf template also printed on to card to make a collage using autumnal shades of wool. I've gone for a pattern and ordered approach but I think a bit of a more haphazard random approach would look good too. Again when the glue was dry (I used pva) I cut out the leaf. Instructions and more photos here. The final two crafts started off the same way. I laid a sheet of clear acetate over the leaf templates, then painted around the edge of the leaves with glue and stuck on a length of wool tracing the outline of the leaf. When the glue was dry I filled in the middle of the leaves with glue. The marbled leaf was made by squeezing on drops of gel food colouring and gently mixing with a cocktail stick (well that was the plan, as photo shows I resorted to a kebab skewer as couldn't find my cocktail sticks). I put on too much colour I think so I'd suggest marbling as you go - you can always add more colour. The glittery leaf was simply sprinkled with glitter. When the glue dried I cut out the leaves and taped them up in the window to catch the sun. The rest of the household is tutting at me now as somehow in that magical way glitter has of spreading itself they find themselves a little bit sparkly!